The Pearl is not new to most of us. I got to know the pearl as a child, watching others wear them and through the many ‘plastic’ pearl chains acquired cheap to satisfy my grooming instinct. As a child I could not be entrusted with the real thing! 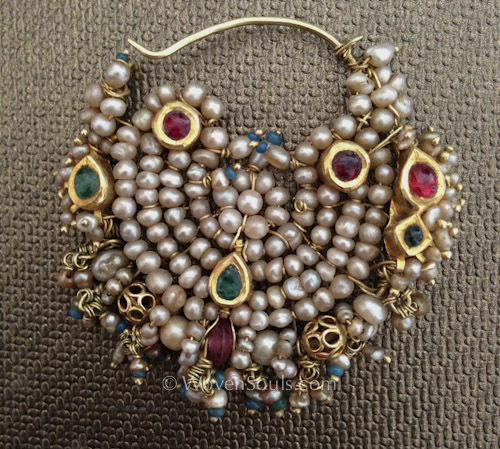 But on Diwali or while attending weddings, I would be adorned with a small string of real pearls in the family jewel box! Then I grew up. 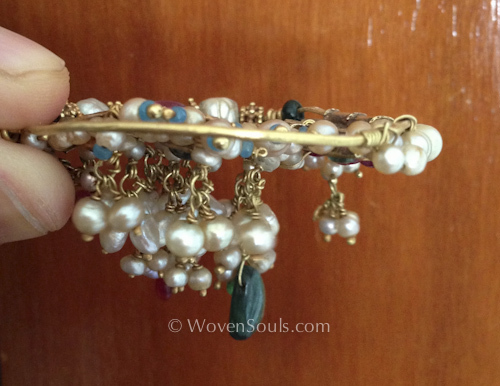 Life took over and work, children and family fun left me with no mindspace to think of pearls. And then came the lull in all the roles I was playing in the lives of other people. The days when I was constantly in pursuit of that one ‘extra’ minute, were finally over. And along with that lull, came an unexpected storm: the storm of desire. For things. Beautiful things. Things left behind by worlds gone by. Things that have witnessed lives beyond ours. Things that were so beautiful that I forgot about empty nests and such other crises! Things that filled up my life with intense craving and consumed all my energy. 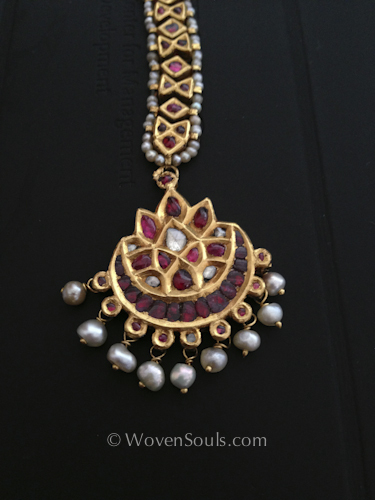 This is the first of those ‘beautiful things’ that filled up my heart : A Pearl & Gold Nath. It was my first step in the world of non-silver jewelry and I remember the angst I went through at the jeweller’s tiny shop wondering whether to spend any money on things I would never wear. 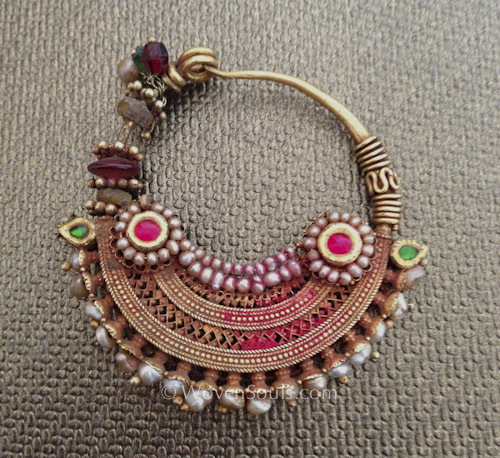 The beauty of the Nath had a grip on my heart as I had never seen antique gold jewelry earlier. The few pieces belonging to my great great grandmother had remained out of my vision locked up in some remote bank vault. So that day in the crowded bazar in an unmapped street of Mumbai, I took my first steps into this wonderful world. After disrupting the work-days of various members of my family to ask their advice, about buying this piece I succumbed and tentatively entered that world. 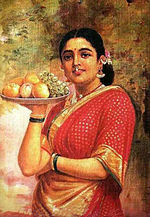 A world from the past, a world inhabited by women like those in the paintings of Raja Ravi Varma. Exotic jewels for exotic women. Each deserving the other. Each outshining the other. If only we knew the lives and loves of these women. If only we could hear the stories that these jewels have witnessed! As I am finding out so late in life, almost everything in Indian culture holds a deeper meaning. Even though all of these are portrayed sensuously and romantically without any trace of vulgarity, I am glad that I learnt these embedded meanings only after reaching the age and stage when nothing embarrasses me. Otherwise it would have been hard not to blush at the insinuations of erotica in these basic things being used daily. 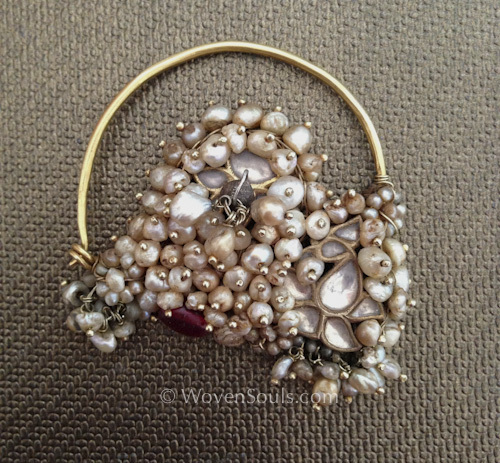 Another article to follow soon on the subject of the pearl ornaments of the Noblewomen of Tibet. i want buy your pearls jewelry…its possible? It’s wonderful I want dis how can I contact I??? 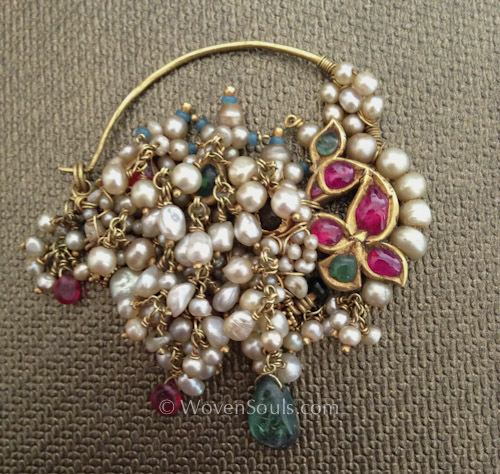 Can you tell us the place where we can still buy these stuff with original pearls? 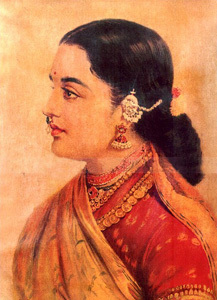 Would like to know the cost of the nose pin for the ‘ bird nath’? 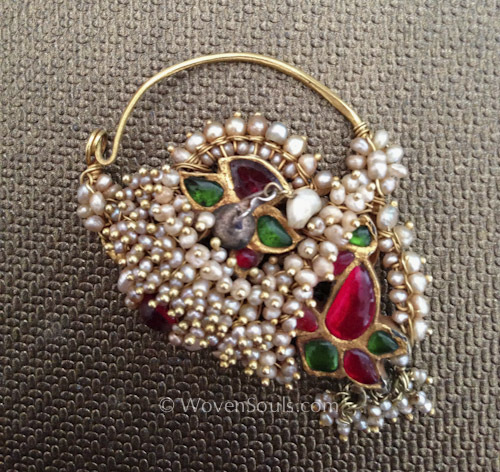 This entry was posted on July 31, 2013 by wovensouls in Art Kaleidoscope and tagged antique basra pearl, antique gold, antique jewelry, antique nath, antique nose ring, antique pearl, art, art collector, collectible, collection, collector, Jewellery, jewelry, Nath, Pearl, pearl jewelry, Shopping.